The American, 37, will overtake sister Serena's record - set when she was 35 at the Australian Open in January - by winning her sixth SW19 title. "I don't think about my age," Williams told BBC Sport. "It is not a factor." 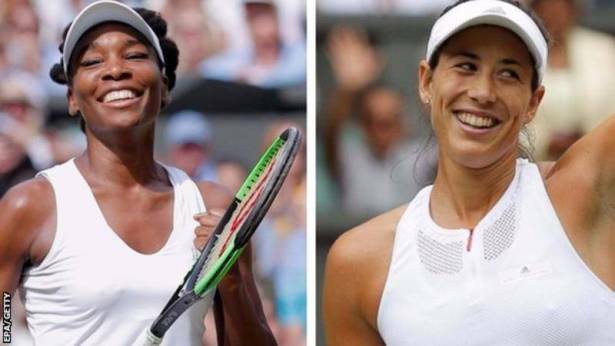 Spain's Muguruza, 23, is aiming for her first Wimbledon triumph after losing to Serena in the 2015 final. "My mind is more equipped this time," said the 2016 French Open champion. Venus Williams dominated Wimbledon for almost a decade between 2000 and 2009, winning five titles and finishing runner-up three times. But the seven-time Grand Slam champion had become a peripheral figure after being diagnosed with Sjogren's syndrome, an illness that causes fatigue and joint pain, in 2011. She says she refused to consider retirement, despite her world ranking plummeting to 103 by the end of 2011. Williams returned to the top 10 last year and reached her first Grand Slam final since 2009 when she lost to Serena in Melbourne earlier this year. Now, after beating Britain's Johanna Konta in the last four, she has another chance to win her first major title since Wimbledon in 2008. "I love the big stage," she said. "There is a lot more pressure and it is about dealing with it. "There are only a handful of players each year who can push and deal with the pressure of playing your best against the best players. "I just love the game and I don't want this part of my life to end. It is not over until it is over." Muguruza, seeded 14th, has dropped down the rankings in recent months after struggling to sustain the form she showed to win last year's French Open. However, she has been impressive at Wimbledon under the guidance of temporary coach Conchita Martinez - the only Spanish woman to have won Wimbledon when she beat Martina Navratilova in 1994. Muguruza fought back from a set down to beat world number one Angelique Kerber in the last 16, and reached her second Wimbledon final by beating Magdalena Rybarikova in a one-sided semi-final. Now she has chance to make amends for that 6-4 6-4 defeat by Serena Williams with victory over her older sister. "The more experience you get, the more you know how to deal with these situations, because they're very special," Muguruza said. "If you felt it before, it's really helpful. So I have more information about the situation." If Venus plays as well as she did against Konta in the semi-finals then it will be very hard for Muguruza to win. You have to try to hang in there and stay close. Venus might have a moment where her level drops a little bit and that's when you have to take your chance. Venus loves this place. She walks into the club and feels more confident. But, most importantly, it is the grass which suits her style of play. She is very alert and it seems like she is more alert when she comes here. She is always looking to move forward and shorten the points. She knows how to play this surface. Muguruza has a very clear game plan and that is where Conchita Martinez has helped her mentally and tactically. She knows what she wants to do and has been able to execute it during this tournament.